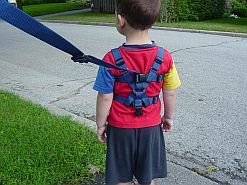 Child Harness lead as a tie-down. 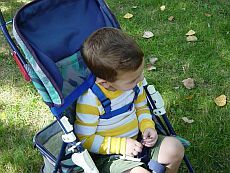 Accessory for Child Harness, Toddler Harness, Special Needs Safety Harness. 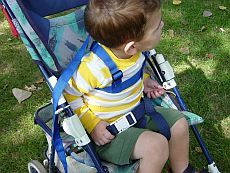 The lead of the Baby Harness or Special Needs Safety Harness can be used as a tie-down to keep your child seated in their stroller or chair. Feedback from customers who have ordered this extra buckle has been amazing. Mealtimes and homework times have been much less stressful on the entire family because the child has been secured in their chair and cannot wander. 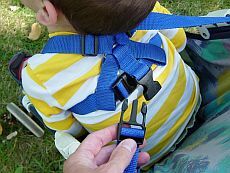 If you plan on using the Safety Harness lead as a tie-down with a number of different chairs in your home and community, we recommend the Chair/Stroller Strap instead of, or in addition to, the lead as a tie-down. 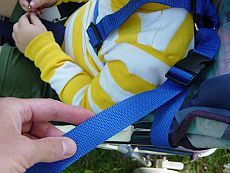 Similarly, if you have a larger or older child with special needs who is likely to exert excessive force on the lead when secured to their chair, the Chair/Stroller Strap would be more appropriate simply because it can take more abuse than the Safety Harness lead. 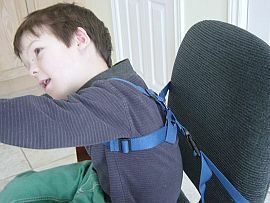 If the Safety Harness lead catches and tears on metal joints or screws that are components of the chair, the lead will be ruined and have to be replaced. 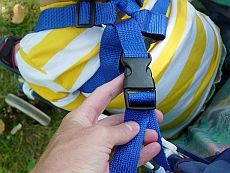 If the Chair/Stroller Strap or loops catch on the chair and become ruined, it is easy and cheap to order replacements. If you would like to use the Safety Harness lead as a tie-down, please select that option when ordering your harness. 1. 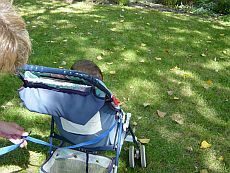 Seat your toddler in their stroller. 2. Wrap the lead around the back of the stroller. 3. Do up the buckle. 4. Tighten the lead by pulling the end. 5. Your child is secure in their stroller.